GDV stands for ‘Gastric Dilitation and Volvulus’. This is a condition where a dog’s stomach bloats (dilates) with gas, food, and/or fluid, and then the stomach also twists. GDV is a life-threatening condition, so it is critically important for dog owners to understand this condition and how to recognize it. Any dog can develop GDV, although it is more commonly seen in large and giant-breed dogs. In simple terms, you may also hear a dog with GDV referred to as a dog that has “bloated”. While bloating is a portion of what happens in GDV, a true GDV is actually more complicated than that. When a dog’s stomach fills up with gas, the stomach becomes bloated (distended). In GDV, things go a critical step further to where the stomach actually twists on the long axis. As you can imagine, if the stomach twists, the entry and exit of the stomach are blocked, and circulation will become compromised. Other body systems can also be affected. GDV is a life-threatening condition that requires emergency veterinary intervention. Risk Factors: While we don’t have a complete understanding of all the factors that may cause GDV, these are some of the more commonly reported factors that may contribute. When a veterinarian suspects GDV in a dog, x-rays need to be performed. This invaluable tool will help the veterinarian know whether the stomach is only bloated, or whether it has twisted as well. If the stomach has twisted, the anatomical landmarks for the stomach will be seen in incorrect locations on the x-ray. The treatment for GDV involves stabilizing the patient by removing some of the gas distension, providing supportive treatments to combat shock, supplement oxygen, and correct metabolic derangements, and surgically correcting the problem. During surgery, the veterinarian first untwists the stomach, and then also “tacks” the stomach to the body wall in hopes of preventing this problem from reoccurring. Of course, any other abnormalities that may have occurred secondary to the GDV that can be corrected surgically are also addressed. Sometimes, internal tissues can lose enough blood supply to make the tissue no longer viable. In these cases, the tissue will need to be removed. For high-risk breeds, consider prophylactic gatropexy. Often this is done at the time of spaying or neutering. A prophylactic gastropexy means the stomach is tacked to the body wall in an attempt to minimize the risk of GDV. Dogs who have had a gastropexy can still bloat, but there is a much lower risk that the stomach will then also twist. 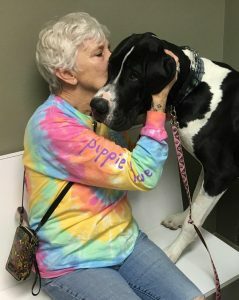 Since Great Danes are one of the more common breeds that will develop GDV at some point in life (Great Danes have a 42% incidence of developing GDV), we wanted to end today’s blog by sharing a few real-life stories about two of our Great Dane patients. First, let’s meet Rohan. Rohan is a 1 year 3 month-old male Great Dane. 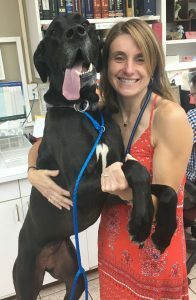 His owner decided to have the prophylactic gastropexy performed at the time he was neutered. Dr. Crawford performed the procedures and everything went very smoothly. Rohan did great for his procedure and throughout his recovery. Now, Rohan’s risk of GDV has been minimized. This is a photograph of Rohan when he came in for his suture removal about 10 days after surgery. Rohan is such a sweetie! Next, we want to introduce you to Max. 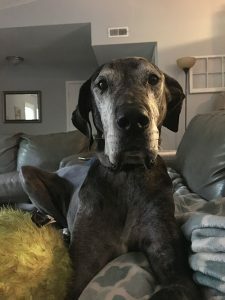 Max is a 7 year-old male neutered Great Dane who belongs to Carmen, one of our amazing technical team members. 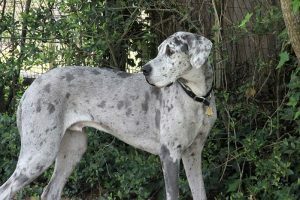 Carmen loves Great Danes (she has 3 currently, and over the years she has actually owned 6 in total!) When Max was around 5 years old, he managed to ingest an entire elk antler. Soon after, he began pacing a lot. He also looked nauseous and was repeatedly retching. Within an hour he appeared bloated and she took him to Lawndale Veterinary Hospital immediately. An x-ray confirmed Max had developed GDV because his stomach was bloated and twisted. Dr. Crawford and Dr. Waterman performed emergency decompression (to remove the gas in the stomach) and then surgically addressed the GDV. They were able to untwist and then tack the stomach. Carmen recalls that within 3 hours of ingesting the antler, Max was already in surgery. Her diligence and quick thinking helped Max get the help he needed quickly. Max’s surgery went smoothly and there were no complications. Thankfully, Max recovered fully and he has been doing great ever since! Bright, R.M. 2007. 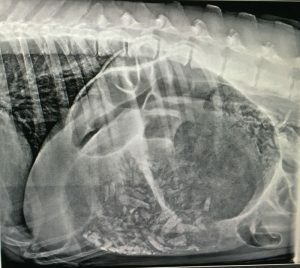 Acute Gastric Dilatation-Volvulus in Dogs. Clinician’s Brief June 2007 (38-41).